The 150 Minute Fitness Challenge winner . . . but aren’t we all really winners? So our first session of the Anthem Foundation 150 Minute Fitness Challenge has come to an end. You may be thinking “I’ve never heard of the challenge and it’s already over?” or “you said first session, can I get in on the next session?” If you aren’t familiar with the program, to quickly sum it up we challenged folks to track their physical activity minutes each week for 10 weeks. We gave them a log to keep track of their minutes, encouraged them to accumulate at least 150 minutes of physical activity each week (the Center for Disease Control’s recommended minimum for adults), and asked folks to seek a basic health screening as well. For participating, individuals received a small prize when they turned in their completed challenge log. For those that met the challenge of 150 minutes for at least 8 out of the 10 weeks, and got a health screening, they were entered to win a $100 gift card! But for all of those who do know about the challenge and participated during the first session, you may be wondering “so who won the grand prize?” Well her name is Doretha Pair and she participated in the 150 Minute Fitness Challenge as a member of the Church Hill Crushers 10k training team. We are so happy for Doretha and love the way she took on this challenge! She achieved or exceeded 150 minutes every week for 10 weeks straight by walking, biking, weight lifting, and running her way to fitness. 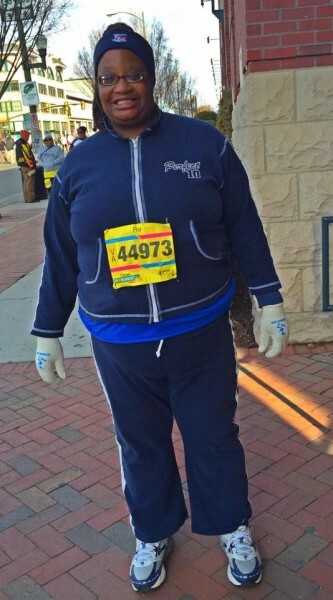 And to top it off, she finished out those 10 weeks by participating in the Ukrop’s Monument Avenue 10k! We think Dorthea is awesome and we love the active lifestyle she is living but what about those of us who didn’t win or who didn’t even get a chance to participate in the challenge?? Not to worry! Well if you participated in the first session of the challenge I doubt you feel anything less than successful, even though you didn’t win the grand prize. I say that because although a $100 gift card is awesome it’s not actually the biggest prize you could win. Consistent physical activity leads to improved health and what could be better than improved overall health? Research shows us that regular physical activity results in a plethora of positive outcomes, including reduced risk of cardiovascular disease, stronger bones and muscles, improved mental health and mood, reduced risk of developing type 2 diabetes, and an improved ability to do daily activities. Those positive outcomes are worth more than any gift card I know of! The challenge is geared towards engaging individuals from our Richmond communities with limited opportunities for physical activity. 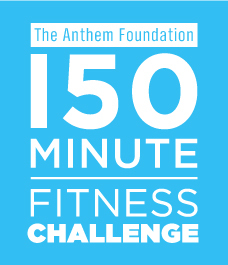 If you want to be a part of the Anthem Foundation 150 Minute Fitness Challenge or if you are a community leader who wants to implement the challenge in your community, contact me! We are already in the second session but come fall we will be gearing up for our third and final session of the year. The important thing here is that you don’t wait for the next session to begin but that you start moving NOW so you can reap the benefits sooner rather than later. It doesn’t matter what you do – what’s important is that you are getting at least 150 minutes of physical activity each week. If you are looking for free fitness classes to help you in your journey, check out the Active RVA Warriors class schedule. So come on RVA . . . let’s dance, run, bike, walk, lift, ski, swim, and play at least 150 minutes each week. Then we can all be winners like Doretha! I challenge you, Doretha challenges you, hopefully you are challenging yourself . . . now who are you going to challenge?? ?